SANTEE — At one time, East County was a hotbed for high school roller hockey. Teams representing Valhalla and Monte Vista, in fact, played in San Diego County High School Roller Hockey Conference’s inaugural championship game in 1996. With three consecutive championship titles (1997-99), Monte Vista was the conference’s first dynasty. 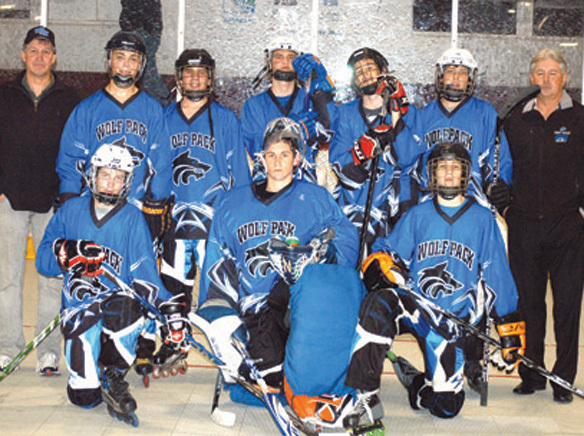 But waning popularity and economics have caused the closure of area rinks over the years and reduced the playing field to one team at present: the West Hills High School Wolf Pack. 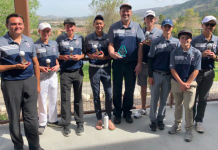 While West Hills coach Steve Baldwin, who served three terms in the state assembly’s 77th District, would like to see more teams from East County playing the sport, his Wolf Pack squad has done a rather admirable job carrying the torch in their absence. Fielding its best-ever team during the 2010-11 CIF-Metro Conference season, West Hills advanced to the Kiwanis Cup championship game en route to earning a runner-up finish to the sport’s current dynasty, the Westview Wolverines. Westview captured the title game, 2-0, on the strength of goaltender Greg Kurth. 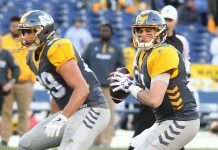 Along the way last season, the Wolf Pack captured the inaugural Central League title with a perfect 9-0 league record and rolled to a final 20-3 season finish following two playoff victories. This season’s cast is nearly the same as the one that earned so many accolades last season. Thus, the team’s goal remains the same: win a conference championship. Last season, West Hills, with its complement of talented ice hockey travel team players, ran into a buzz saw in Kurth. With Kurth now having graduated, the playing field suddenly seems more level. The Wolf Pack rolled to the midpoint of the 2011-12 campaign with an 8-2 overall record. Regular season play extends through mid-February, with the Kiwanis Cup championships providing a fitting cap to a long 20-game regular season the last week of February and the first week of March. West Hills’ lone two losses have been to Westview (6-4 in the season opener on Nov. 28) and to the Poway Titans (8-5 on Jan. 2) — the two teams currently tied for the 18-team conference’s top record with identical 11-1 records. West Hills improved to 4-0 in Central League play by defeating St. Augustine, 6-2, in a game played Jan. 18 at the Escondido Sports Center. Cody Boyer led the Wolf Pack with three goals and one assist while David Gulliver, Brad Majeski and Cory Dermody each scored once in support of goaltender Garret Schilling. Prior to that game, West Hills zipped past the Del Norte Nighthawks, the conference’s newest member, by a score of 15-1. In that non-league contest, Dominic Keiser paced the Wolf Pack with six goals and two assists while Dermody racked up four goals and one assist, Eric Baldwin notched three goals and two assists and David Baldwin collected two goals and three assists. Eric and David Baldwin are the sons of the West Hills skipper.
. The Wolf Pack lost three seniors to graduation but added two talented underclassmen to reload in its title quest. Gone are All-CIF defenseman Spencer Gaalaas and all-league defenseman Joe Swanson. West Hills also lost the services of standout netminder Kenoa Cooke to an elite hockey prep school. However, the Wolf Pack picked up a pair of 16U AA ice hockey players in the guise of Majeski (a junior forward) and Ryan Vanoni (a sophomore forward). Impact returners include David Baldwin, a junior forward, and Eric Baldwin, a senior defenseman, junior forward Boyer, Dermody, a senior forward, Jared Wiese, a senior defenseman and Keiser, a senior forward. Returner Ryden Kerr and newcomer David Gulliver, a junior forward, round out this season’s talent-laden roster. and Dominic Keiser with 14 goals and19 points. It has been an all-around effort in 2011-12, with 10 players picking up at least one goal in 10 games and six players scoring at least a dozen points. What West Hills has working in its favor this season, and for future seasons, is a three-tier development system, with 12 players each on varsity, junior varsity and junior high teams. “Making it to the finals last season attracted a bunch of kids,” Steve Baldwin said.